This Luxury Sailing Yacht was designed and built to the highest standards by the award winning Alloy Yachts International yard who have been credited with building some of the worlds best and biggest Super Yachts. 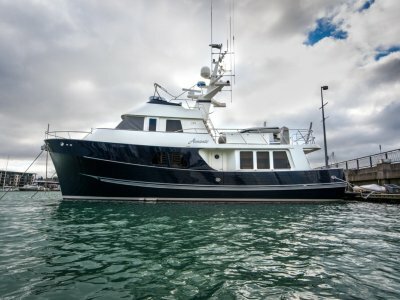 S/V Pacific Eagle is now being presented to the market and will give her new owner an opportunity to roam the worlds oceans in complete safety, comfort and style. She is a New Zealand Registered Ship (Under full MSA survey)Lloyd's Qualification 100A1+ L. M. C. All taxes and duties are fully paid in New Zealand. There was a major refit undertaken in 2002 to update her systems to the highest available at the time. Since then her owners have continued to keep her in a condition that is not often seen, by closely monitoring the strict maintenance program they have in place. Interior designer Bruce Woods and Bret De Thi were commissioned during the initial build to work with the owners to achieve the highest standards possible. This special vessel has the inherent ability to cruise with safety and comfort to the four corners of the globe while maintaining an ease of handling that is usually only seen on much smaller yachts. With in mast furling she presents with exceptional clean lines while motoring or at anchor. Ten knots under power ensures she maintains a good turn of speed when needed. Stowaway Sails and Winches, all hydraulically operated, help cruise with limited crew when necessary. Twin Helms on the aft deck combine with the state of the art internal Helm station give the opportunity for the skipper to choose his position depending on the point of sail, along with the prevailing conditions at the time. Below decks you are enveloped in luxury throughout this yacht. There are almost too many features aboard to fully describe here but as you will see from the images provided she would suit the most discerning buyer. "SV Pacific Eagle's" owner now has other passions to follow, so is motivated to sell. He has asked that we present all offers for his considerstion, including trades of vessel or real estate. 5,000 litres Plus Matrix 6,300 litres a day Watermaker. Accommodation on this yacht allows for Owners stateroom, One spacious double guest cabin with full ensuite, One guest cabin with generous twin singles and full ensuite. Along with separate crew accommodation for four people. Moving forward from the cockpit through the double opening timber and glass doors and down two steps into the day saloon and bridge you immediately notice the attention to detail that you see throughout this exceptional yacht. Entry from the exterior entertaining area and helm stations is seamless due to the size of the opening being carried through to the internal space. Generous use of white leather on the lounges both here and further on in the main saloon give the feel of opulence along with genuine comfort. Once inside you will find seating for six on a curved settee around a fine timber table to port and another small settee for forward of the side opening ships door. This is duplicated to starboard although you have a navigation table and chart lockers forward of the side ships door. On center line and directly aft of the captains chair (seats three) is a cabinet complete with single S/S sink and Hot and Cold mixer. This could be used as an entertaining station while guests are aboard. The ship's helm and bridge layout is to die for with all systems within easy view and reach. Great vision around 360 degrees and excellent natural lighting make this the place to relax during the day. Venturing forward you enter the Piece de Resistance. The visual impact has to be seen to be believed. Two elegant large white leather lounges fill what would usually be an enormous space. They bring the size here, back to scale by forming two semi-circles either side with a wide passage between. Port side has a large dining table while to starboard their is a low coffee table. Mood lighting sets the scene for intimate dinner party's while generous ports and side windows let the natural light in during the daytime. As you enter the Saloon down the stairs directly to port is another well placed work station for computers and the like. Throughout the entire area lockers and cabinet's abound. As you progress forward from here you will enter the large U shaped Galley. The layout and equipment is more fully described below. On again toward the bow is the crews quarters featuring two cabins each with separate head, shower and vanity. One is a double berth and the other has two singles. A four person lounge with table completes the package. Aft of the main saloon down another curved set of stairs you enter the Guests accommodation and through to the owners stateroom. Firstly the Double cabin is to port with full ensuite and opposite here you have another cabin with two generous singles and another separate full ensuite. Both cabins are also tastefully appointed and have ample storage. Continue aft and you start to get to the business end with entry to the Master Stateroom on the centre line. The outstanding feature here is the large forward facing island bed. No expense has been spared when it came to furnishing throughout this yacht and this is evident here with the quality of fittings and furnishings well above the norm for a yacht this size. Another design feature is the addition of a large lounge and reading table. Moving into the equally well appointed Master Ensuite to starboard and forward we have the Jacuzzi, Shower, Vanity and Head. We will let the images describe this best. The carpet used below decks is of high quality and protective floor coverings (all carpets) are used. There are Six heads situated throughout this vessel. Five are in the ensuites in the cabins and one for visitors situated discreetly at the rear of the main saloon and to port of the lower stairs. Gaggenau electric cooktop x 4 rings. Jura Inpressa automatic coffee machine. U-Line 30 bottle wine chiller in saloon. Two x electric water cylinders @110 liters each. Bosch front loader washing machine. Silver service, white ware, glassware and monogrammed plastic ware. Having Two stainless steel 250lbs anchors keeping her in place if needed will give you peace of mind even in the worst conditions. These can be operated from the pilot house additionally when necessary. Assorted rode and lines as you would expect from a yacht this size. One FM200 flood engine room fire system Automatic or manual outside the engine room with alarms in the pilot house and hallway. Fifty life jackets in new condition. Two Seasava Plus x six person each life rafts. ( NZYF Cat1), One of these units is new. Two Grab containers with all current flares. Two 22kw Northern light generators supply onboard power for all the extensive electronics this yacht features. Two Master Volt 110v inverters. Two Master Volt 100amp battery chargers. Two Master Volt 30amp battery chargers. Furuno 96 mile radar with plotter. Furuno navnet 65mile with color radar and plotter. Furuno colour depth sounder and fish finder. Datamarine boat speed/total distance recorder. Robertson FU9 hand steer interface. Raymarine wind gauges with rear helm repeaters. ICOM -M802 NZ SSB radio. Three ICOM hand held VHF radios with permanent charging. Three Uniden hand held radios with head units. Blaupunkt CD player with iPod doc station and amplifier. Two outside speakers with there own amplifier. Navigation flat screen monitor with wireless keyboard controller. Fiber optic alarm and status board. Three mast mounted video cameras for security and safety. Inmarsat C/GPS TrimbleTNL7005 with distress call. Three Daewoo cordless phones in saloon, captain's cabin and pilot house. Gyro compass - Magnetic compass - Electric compass all connected to autopilot. Sharp Plasma Monitor with Bose home theater system in saloon. Toshiba DVD player in saloon. SeaTel sky TV satellite tracker. Ketch Rigged with in mast furling. The best of equipment has been used here and with the owners continual maintenance regime in place all rigging is in excellent condition. Stainless steel gas barbecue with bottle. 80 litre built in petrol tank with hose and filler tap for tenders. Large inventory of warps, pulleys and sails equipment. "I have owned Pacific Eagle for the past 13 years. I remember the day she was launched in Auckland and made big nautical news as she was the second Super Yacht "Alloy Yachts International "had built. She was designed by Don Brooke, a well-known pilot-house ketch designer and took the `belts and bracers` approach to all his builds which also included the 3 mast schooner training ship "Spirt of New Zealand. " 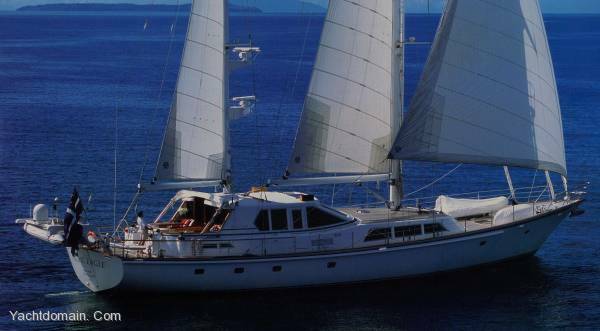 At this time I owned a 65ft pilot-house Ketch, built in NZ named "Dionysus" which we cruised all the Pacific Islands in for 15 years. When PE. Came on the market it took me 3 years to buy her, travelling to Fort Lauderdale where she was based at that time. She was foreign reregistered and after purchase I imported her to N. Z. Paying all taxes and gaining her tickets to put her into charter, which she still is. PE has been maintained to the highest standards, having a 1.5 million NZD refit at the time of purchase bringing the yacht back to nearly new condition. PE has been a very successful `high end' charter yacht, having clients from all around the world. 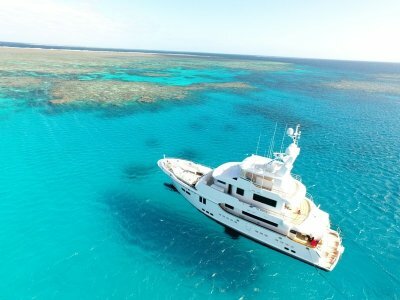 With her ideal layout she is also a great family yacht and we have cruised most of the Pacific Islands on her. The reason I am writing this is to highlight how easy it is to manage PE. The odd person who has shown interest, straight away says, I will need a captain, engineer and deckhand. While I have engineering knowledge I have always run the yacht on my own and skippered her, bringing in specialized people only when required. PE has a very simple spacious engine- room layout with no hidden equipment. There are no computerized systems on the 4 engines. Everything is well marked and less intimidating than most 60ft yachts one goes aboard. When on a nonstop transit we have 3 and sometimes 4 crew for the passage. The couple who previously owned her sailed her from Fort Lauderdale to New Zealand on their own. I have often been sailing for the day with just my wife. When we charter I have the same gourmet chef and female hostess who join the yacht wherever we happen to be. web page. She has massive storage on board, including over 30 cubic feet of freezer space and can easily be self-contained for over 6 months. The fuel capacity is 12,500 litres giving her a huge range at 23 litres per/hour running her 2 engines and one generator at cruise speed. The range can be increased dramatically by feathering one propeller. She holds 5000 litres of fresh water and makes 4 litres per/minute. She has a massive amount of spares, all set up for extended periods. Most parts are bolt-on complete plus repair kits. She also has a Panama Canal Identification Number. There must be family or someone's dream to sail an adventure. Pacific Eagle has given my family and friend's endless pleasure, with so many spaces, there is room for everyone. An ideal place to start a cruise would be NZ, then on to the Pacific Islands. The yacht is ready to go as she sits now - all safety requirements are up to date, and all that would be required is provisioning. 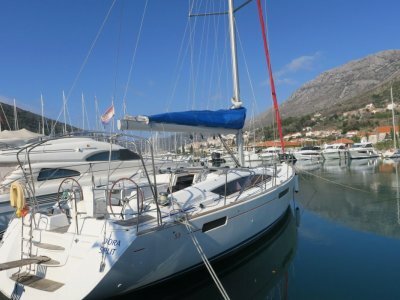 I would undertake to make sure a new owner understood the full workings of the yacht and if they need it skippered somewhere I would be available. " SV Pacific Eagle's owner has other passions to follow, so he is motivated to sell. He has asked that we present all offers for his considerstion, including trades of vessel or real estate. This remarkable vessel is equipped with state-of-the-art navigation, global communications and electronics from the tip of the mast down to the bottom of the keel. She offers unparalleled levels of comfort and safety and is something out of the ordinary. Whether you are relaxing over a drink, entertaining clients or sharing a meal with close family and friends every requirement is catered for on this incredible vessel. If traveling the worlds oceans to those idyllic and exotic destinations is your intention then you need look no further as this will be the yacht to take you there. Inspection is by appointment only. To arrange an appointment to view this stunning vessel please contact Rob Devers at Yachtdomain on +61 407 112 265 or via email rob@yachtdomain. Com or any of the contacts below.